Jennifer serves as our Marketing and Client Relations Director and as an Administrative Assistant for our office. Jennifer received her Associates Degree from the University of Florida in 2008, and is a 2010 graduate of Florida Gulf Coast University. 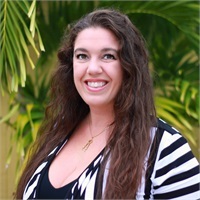 She sits on the Punta Gorda Chamber of Commerce Resource Development Committee where she was appointed the leader of the weekly Punta Gorda Pub Runs, Arts and Humanities Council Dancing with the Charlotte Stars Committee, and the Downtown Christmas Tree Lighting Committee. She is a past Board member of the Charlotte County Young Professionals and a past member of Team Punta Gorda. Jennifer is a graduate of the Leadership Charlotte Class of 2016. She will serve as the Vice Chair for the 2019 Leadership Charlotte Class and will serve as Chair for the 2020 Leadership Charlotte Class. Jennifer was a recipient of the 2018 Charlotte County Chamber of Commerce 4 Under 40 Award, acknowledging young professionals in Charlotte County who are blazing a path to success and making a notable impact on the community. Not registered with FSC Securities Corporation.